Galapagos Flamingos or Caribbean Flamingos (Phoenicopterus Ruber) are gregarious, wading birds that belong to a family of large, brilliantly coloured aquatic birds whose habitats are alkaline or saline lakes. 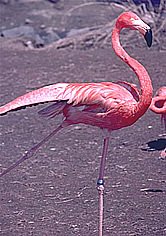 Long legs and a long, curved neck are characteristic of all flamingo species. All flamingos are found in tropical and subtropical areas. Galapagos Flamingos reside in the salt-water lagoons hidden in the lava fields behind the coast of the Galapagos Islands. The Galapagos Flamingo measures 120 – 140 centimetres in length, males weigh 2.8 kilograms and females 2.2 kilograms. Most of their plumage is pink, giving rise to its earlier name of Rosy Flamingo and differentiating adults from the much paler European species. The wing coverts are red and the primary and secondary flight feathers are black. A flamingos beak is pink with a restricted black tip and the legs are entirely pink. A flamingos call is a goose-like honking. Flamingos filter-feed on brine shrimp. Their oddly-shaped beaks are specially adapted to separate mud and silt from the food they consume and are uniquely used upside-down. The filtering of food items is assisted by hairy structures called lamellae which line the mandibles and the large rough-surfaced tongue. Flamingos also feed on small crustaceans (shelled fish). The flamingos diet of tiny water plants and crustaceans is full of substances called ‘carotenoids’. These carotenoid pigments cause flamingos feathers to turn pink. It is mostly the pigment in the crustaceans that is responsible for their beautiful pink colouring. The more their diet contains these substances the pinker they become. Flamingos filter out the small crustaceans with their heads upside down. Flamingos frequently stand on one leg. The reason for this behaviour is not fully known. One common theory is that tucking one leg beneath the body may conserve body heat, however, this has not been proven. It is often suggested that this is done in part to keep the legs from getting wet and in addition to conserving energy. In addition to standing in the water, flamingos may stamp their webbed feet in the mud to stir up food from the bottom. Flamingos build nest mounds made of mud, small stones, straw and feathers. Both females and males use their beaks in building their nests. These mounds may be as high as 12 inches high because they serve as protection against the extreme heat and flooding that occurs at ground level. Flamingos usually lay just one large egg and both male and female take turns incubating the egg by sitting on the nest. Incubation time is between 21 – 36 days. Because there are no regular breeding seasons, chicks hatch throughout the year. Newly hatched chicks have grey or white down feathers and a straight red beak. Their pink feathers begin to show after a two or three year period. Flamingos do not begin to breed until they are 6 years old. Flamingos produce a ‘milk’ like pigeon milk due to the action of a hormone called prolactin. It contains more fat and less protein than pigeon milk and it is produced in glands lining the whole of the upper digestive tract, not just the crop. Both parents nurse their chick and young flamingos feed on this milk, which also contains red and white blood cells, for about two months until their bills are developed enough to filter feed. In the wild, flamingos can live until they are 50 years old. 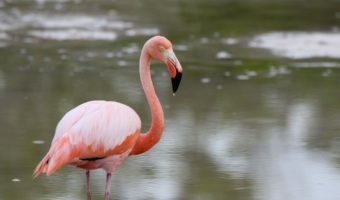 The Caribbean Flamingo is one of the species to which the Agreement on the Conservation of African-Eurasian Migratory Waterbirds (AEWA) applies. Caribbean Flamingos are currently classed as ‘Least Concern’. Flamingos can only eat with their head upside down. Their beaks have lamellae (thin, flat membranes) which are used to filter the mud. Flamingos may rest either sitting down with their legs tucked beneath them or standing on one leg. Flamingos are the bird with the longest neck and the longest legs compared with body size. Flamingos are very social birds. Colonies of tens of thousands of birds are common. Flamingos have good hearing but little or no sense of smell.